For a low monthly fee, you can access the traffic tickets, moving violations, and court documents of anyone in the U.S.
Disclaimer: TruthFinder cannot be used for employment or tenant screening. TruthFinder is not a consumer reporting agency as defined by the Fair Credit Report Act. Please note that this is a subscription-based service. As a commercial driver, you face harsher penalties when it comes to committing traffic violations. This article summarizes some of the penalties you'll face for both major violations and minor offenses. If you're ready to pay or fight your traffic ticket, visit the Traffic Tickets page relevant to your state. As the holder of a commercial drivers license (CDL), you're held to a higher standard when behind the wheel - kind of a the -bigger-the-vehicle-the-bigger-the-responsibilies type mindset. And, with this higher standard comes higher repercussions when traffic tickets and DUI convictions are involved. The best advice is to avoid getting ticketed. This applies to all driving situations, regardless of when, where, or how. As a truck driver, you could jeopardize losing your CDL even while getting ticketed behind the wheel of your family car. Driving under the influence of alcohol (DUI). Operating under the influence of a controlled substance. Fleeing the scene of an accident. Causing a fatality due to negligent driving. Having a blood alcohol content higher than the state's designated legal limit (this varies by state). Using the vehicle to commit a felony. Using the vehicle in manufacturing, distributing or dispensing a controlled substance. Trucking while your CDL is suspended, revoked, or cancelled. Speeding 15 mph or more above the posted speed limit. Operating a commercial vehicle without your CDL in your possession. Driving a rig without the proper endorsement. The suspension or revocation of your commercial drivers license. 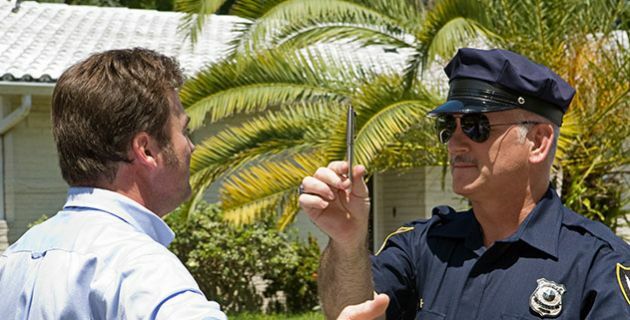 How long contingent on your state, the nature of the violation, and your driving record. You'll then face, once cleared to resume driving, expensive license reinstatement fees. Points assessed to your drivers license, if applicable to your state. Top a specified amount of points as designated by your state and you could lose all driving privileges. The temporary or permanent loss of your job. Possible jail time, dependent, of course, on the nature of the violation. If convicted of any of the above violations, you are required, by law, to notify your employer. Depending on the circumstances surrounding your ticket and what's at stake, you may want to consider hiring a traffic attorney who specializes in CDL affairs. Keep in mind that HAZMAT drivers are under tighter scrutiny; penalties are magnified even more. Are you a CDL driver who's ever gotten a traffic ticket while trucking?